and at Schuler Books (2660 28th St. SE). 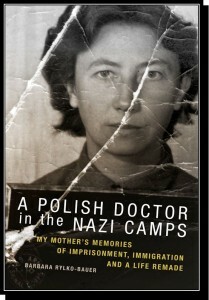 Anthropologist Barbara Rylko-Bauer has written an intimate ethnography that weaves personal family narrative with twentieth-century history to present a daughter’s account of her Polish Catholic mother’s World War II experiences as a prisoner-doctor in Jewish slave labor camps in Nazi Germany. Jadwiga Lenartowicz Rylko (known as Jadzia) was training to be a pediatrician in Poland when the war began. Arrested at the start of 1944, she endured three concentration camps, a 42-day death march, and the challenges of “surviving survival” – rebuilding a new life, first as a refugee doctor in Germany and later as an immigrant in the United States. A Polish Doctor in the Nazi Camps is structured around Jadzia’s voice—using quotes from interviews that Rylko-Bauer conducted with her aging mother, but also incorporates the daughter’s own journey of rediscovering her family’s past. The resulting narrative about survival, displacement, memory, and resilience demonstrates how powerful historical forces impact individual lives, while augmenting our understanding of World War II, the Holocaust, and the struggle of immigrants in the aftermath of these tragic events. The story is enriched with personal photographs and letters, archival documents, maps, and testimonies; it also includes historical notes and a bibliography for those readers who desire more indepth background information. Written in an accessible style, the book is appropriate for classroom use but will also appeal to general readers interested in biography, memoir, women’s history, the Holocaust as well as the Polish Catholic experience of World War II and the postwar period. Paul Farmer, “The Tremendous Suffering of Ordinary People”, the Boston Review, January 5, 2015. Leonard Kniffel, former editor-in-chief, American Libraries — from his blog, “A Polish Son,” June 28, 2014. Erika Bourguignon, co-editor of Exile: A Memoir of 1939 — excerpted from The Antioch Review, Summer 2014, vol. 72, no. 3, p. 603. Gretchen Schafft, author of From Racism to Genocide and Commemorating Hell: The Public Memory of Mittelbau-Dora — excerpted from Medical Anthropology Quarterly, Oct 23, 2014, online version.